When you’re cooking for friends, need a side dish and are bored with baked potatoes, find some Walla Walla sweets or yellow onions. Cut off the ends, but don’t peel them. Cut a cross into the tops, scoring them about halfway down the bulb. Coat them with olive oil. Sprinkle on a bit of salt. Place them on a baking sheet and roast them at 350 or 400 degrees. Watch them begin to open up, caramelize and char a bit on top. 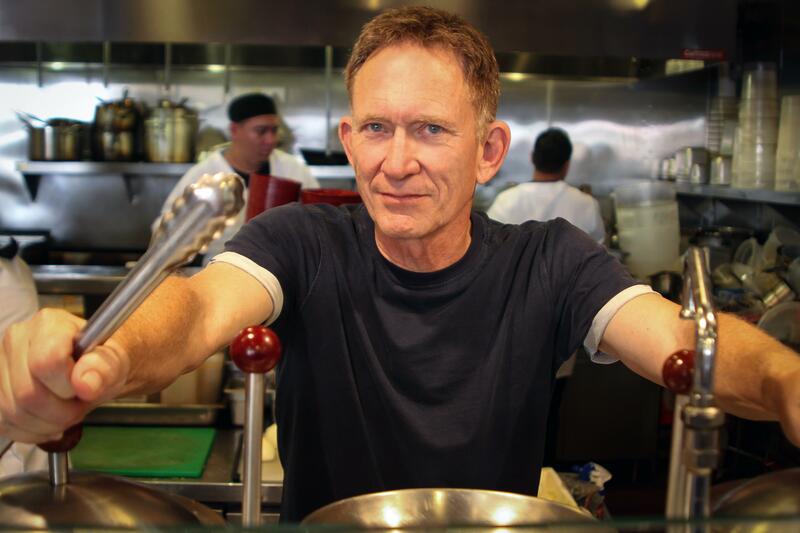 Peel, who co-founded La Brea Bakery, is in the process of flipping his fast-casual Bombo eatery in downtown LA into a place called Prawn, which is focused on traditional seafood dishes such as lobster rolls and fish-and-chips. A second location is planned for Pasadena. He’s leaning toward preparing something with shrimp, perhaps a shrimp butter boil that marries the flavors of Louisiana and southern India. Peel loves curry. And he loves shrimp. Shrimp are among his go-to ingredients. They can be prepared quickly, with a dry rub, then stir-fried with vegetables and served with rice or potatoes – or his simple specialty of roasted onions. Another staple: “Chicken is always a good thing at home. It’s easy to cook in so many incarnations.” Peel prefers thigh meat “not just because it’s less expensive but because I think it has much better texture. It’s juicier and flavorful. Mark your calendar: Mark Peel presents his culinary stage demo from 2:30 to 3:15 p.m. Friday. Published: June 13, 2017, midnight Updated: June 14, 2017, 10:14 a.m.